FIMEXMART has just launched a special discount gift voucher for customers who order for purchasing on FIMEXMART for their first time. 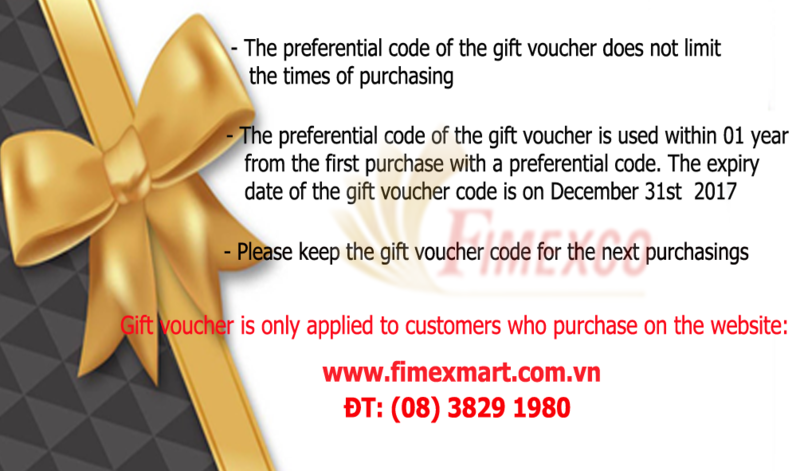 The gift vouchers are applicable for all products when customers order on FIMEXMART.com.vn. The gift vouchers are also applicable to promotion products, so if this is the first time customers purchase on FIMEXMART.com.vn customers can choose promotion products, and then customers can use this gift voucher to have a very big discount for next purchasings. – Gift voucher is only applied to customers who purchase on the website: fimexmart.com.vn. – VND 50,000 discount for the order cost VND 1,000,000. – VND 100,000 discount for the order cost over VND 1,000,000. – With the special and preferential discount when buying at Fimexmart, customers will be accumulated purchasing points at Fimexmart. When the total value of orders is VND 5,000,000 customers will be offered 01 product worth VND 500,000. – The preferential code of the gift voucher does not limit the times of purchasing. – The preferential code of the gift voucher is used within 01 year from the first purchase with a preferential code. The expiry date of the gift voucher code is on December 31st 2017. – Please keep the gift voucher code for the next purchasings.